Individual survival gear approaches have two common categories: tactical and non-tactical. The two approaches to personal gear feature some common items. However, they also have some stark differences. Therefore, it is essential to have a working understanding of both approaches. It will help you to discern the kinds of resources to purchase and types of kits to build. In a previous article, we discussed the three popular approaches to survival. The purpose of that article is to familiarize you with the conventional methods of survival in general. In this article, we will close in on the two common approaches people use to purchase and organize their survival gear. There are a few factors to keep in mind when assessing which method to take regarding your survival or prepping loadout. The first factor influencing your survival gear approach is your experience with your equipment. People tend to fall back on what they are comfortable with in general. How a person organizes their survival or prepping gear is no different. The second factor is knowledge about your survival gear. Most people will only put gear in their survival loadout in which they have knowledge and experience. The final factor governing the approach one takes to survival gear loadout is finances. Some people cannot afford the top-of-the-line survival gear regardless of the approach that they prefer to use to build their kits. Consequently, they look for budget-friendly quality gear to develop their loadout. The tactical approach centers on finding a military or tactical solution to solving survival and prepping questions. The individual gear that typically identifies this approach is the military surplus items. However, the modern tactical gear designed for the military or law enforcement also falls into this approach. If one prefers the tactical approach to gear and gear organization, then learning how the military or law enforcement personnel use and organize their gear will be of interest. Typically, this approach appeals to those with current or previous military or law enforcement experience. However, there is a growing interest in this approach among those never associated with military or law enforcement. Military packing lists for various situations helps one to understand this approach. The most common packing list of this type is the ALICE rucksack packing list. Military manuals covering survival gives insight into the tactical approach to survival and preparedness. However, as with anything related to military and law enforcement, gear recommendations and techniques for their organization are directly related to military and law enforcement operations. They are never meant to be duplicated by those not employed in those professions. There are some advantages to the tactical approach. The most significant advantage is the proven reliability and practicality of military gear and its use in the field. Most individual tactical gear in use with the military or law enforcement must meet high standards and pass rigorous testing. Consequently, the tactical gear tends to be of higher quality than its non-military counterparts. Moreover, the way military and law enforcement personnel organize and use their gear also brings some reliability to the tactical approach. For example, many people are interested in how the SOF community approaches survival and prepping. Why? SOF approaches have inherent credibility and reliability. 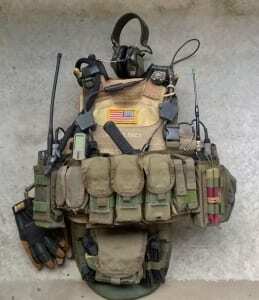 Therefore, desiring to know what gear the SOF community uses and how they organize it is of interest. The main drawback with the tactical approach to gear and gear organization is it can give a false sense of security. 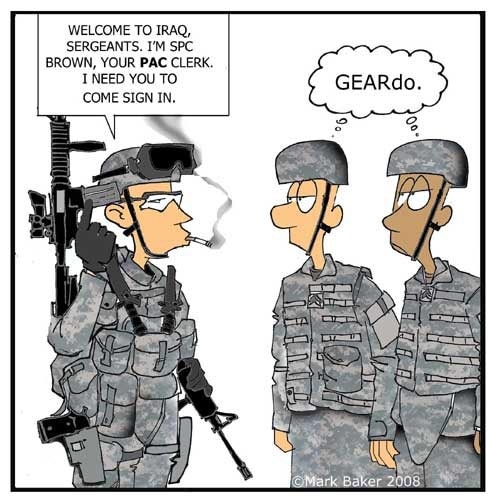 A well-known comic artist published a meme several years ago called, Gear-do, a wordplay on the word, weirdo. It shows a soldier all kitted up to kick in doors, who is in an administrative desk job. In essence, the soldier had too much gear for the situation and his good. Furthermore, possessing tactical gear, in-and-of-itself, does not guarantee you will survive an emergency. You have to be proficient in using it. The second most common way people approach gear purchases and organizing that gear is known as the non-tactical approach. The non-tactical approach to gear and gear organization is a favorite method of bushcrafters and homesteaders. The growing interest in being a “gray man” is also fueling the non-tactical approach. This approach emphasizes gear that reflects the frontier, old west, or everyday carry (EDC) in an urban or suburban setting. Leather and non-camouflage gear is a characteristic of this approach. Weapons preferences also tend to be non-tactical, such as revolvers over semi-automatic pistols. Leather and solid color nylon pouches are a preference over camouflage ones. Furthermore, backpacks tend to be solid colors, like black or grey, without much Pouch Attachment Ladder System (PALS) webbing, if any. The main advantage of the non-tactical approach to gear and gear organization is that it facilitates stealth. Those looking to blend into their environment and to avoid confrontation should consider a non-tactical approach. Another advantage of this approach is that it tends to simplify backpack organization into dry bags, stuff sacks, or Ziploc bags. Furthermore, the non-tactical approach offers more variety of colors for a piece of gear than the tactical. Kelty, for example, offers various colors for the Redwing 50 non-tactical packs. There is a limited color choice for their tactical line of backpacks, like the Raven 2500. The non-tactical approach brings some difficulties. The most significant weakness in the non-tactical approach is in the durability and reliability of the gear. Generally, non-tactical backpacks do not feature ballistic Cordura® nylon as the primary construction material. Non-tactical pouches have thin ripstop nylon. Moreover, the non-tactical approach to organizing gear is to put it into dry bags or cinch sacks. Consequently, this approach may cause a waste of time looking for an item inside a backpack. Whereas, that same piece of gear may be stored in an outside pocket of a 5.11 Rush backpack, ALICE rucksack, or Condor Battle Belt Rig. The approach that one takes to gear and organizing gear will occupy much time and thought. Tactical and non-tactical approaches have advantages and disadvantages. The environment in which you will most likely have to operate during a survival emergency will dictate your preferred strategy. Some people use a hybrid approach. They borrow aspects from both the tactical and non-tactical elements and blend them into a personalized method. However, it is wise also to consider your knowledge and experience with gear and gear organization methods. Therefore, it is helpful to take time to review your approach, the gear you use, and how you will organize it.